The first album in David Bowie's Berlin Trilogy sees Bowie as a tragic figure. The album's first side is a beautiful futurist ruin, littered with holes left purposefully unfixed, while the blank, instrumental second side feels like a calculated attempt to kill the author. Compared to its predecessors, David Bowie's 11th studio album is noticeably reserved. "I had no statement to make on Low," said Bowie, who could hardly write lyrics at all in the aftermath of his L.A. excesses, let alone fashion another extensive character study like Ziggy or the Thin White Duke. His lyrical gifts were already spread thin, and thinner still when a completed third verse was cut from "Always Crashing in the Same Car," in which Bowie did his very best Bob Dylan impression. Producer Tony Visconti thought it was so creepy, and potentially inappropriate given Dylan's motorcycle accident a decade earlier, that they scrapped it. Bowie was hardly lucid in 1976, but you bet he knew exactly what he was doing with that verse. The mysterious injuries from Dylan's 1966 accident gave him the excuse to disappear from the rat race for years, whereas the full complement of wounds Bowie sustained in L.A. were proudly displayed for a while: the Station to Station-era diet of cocaine, red peppers, and milk, and the ensuing physical and psychic degradation that led him to endorse fascism, fear the occult, and allegedly keep his urine in the fridge lest anyone steal it. (From a flushed toilet?) When he realized he had to leave Hollywood and kick his prodigious habit, West Berlin appealed for its anonymity, though unlike Dylan, Bowie would make his own recovery a matter of public record. Both artists were escaping paradigmatic American success by retreating into themselves. Where Dylan let rumors of death fester, Bowie opened his hermitage to the world, reinforcing his outsider myth. The Bowie of this era is a tragic figure: strung out and prone to spending days awake watching the same films on a loop. He was broke from the aftermath of a bad managerial deal and drained by the related ongoing court case, and so paranoid that, after his destitute charge Iggy Pop pushed him in the pool at the residential Château d'Hérouville studio in France, he had it exorcized to avoid being touched by the "dark stains" that he believed lurked at the bottom. Yet Bowie's sense of purpose was at least somewhat intact. He applied exacting pressure on Iggy to make The Idiot as good as he knew it could be, and brought similar determination to Low, albeit the kind where having very few aims was its own liberating objective. Whatever they made didn't even have to be released, he told his new collaborator Brian Eno, who was brought in alongside Station to Station's crack band to further develop that album's hybrid of electronic R&B. Low's first side is a beautiful futurist ruin, littered with holes left purposefully unfixed. Two decades after its release, Bowie noted that his crew "really captured, unlike anything else in that time, a sense of yearning for a future that we all knew would never come to pass." Visconti heightens the decay and distills the lifespan of every sound, treating Dennis Davis' drums so that he was playing along to a withered echo of his last strike, like an explosion contained in a tin can. Even Bowie's voice sounds aged and distant. Eno's sharp electronics jostle against the bolshy funk rhythms and Carlos Alomar and Ricky Gardiner's guitars, giving the record a feverish euphoria that hits like too much pseudo-ephedrine and mangles linear time. These swaggering fragments, seldom breaking the three-minute mark, promise bombastic payoffs but then fade out instead. Low's first side feels like having the carpet ripped out from under you by three wizards who have plans to fly it elsewhere. All this playfulness means that Low's reputation for utter desolation doesn't feel quite right. Bowie is, of course, obsessed with barriers to connection: the sudden instinct that causes him to yelp and back away from someone on "Breaking Glass" ("You're such a wonderful person/ But you got problems/ Oh, oh, oh, oh, I'll never touch ya"), self-imposed isolation ("Sound and Vision") and isolation from the self ("What are you gonna be/ To the real me," on "What in the World"), and a semi-serious plea for lifelong companionship just as his marriage was disintegrating ("Be My Wife"). From the windows of Hansa Tonstudio (where the record was mostly finished, not tracked) the band could see into the watchtowers atop Berlin's dividing Wall. A lot of Low's lyrics were extemporized, but the consistency of these ornery admissions, however fragmented, implies a self-aware desire to push past them, to hunt some trace of optimism. At the end of side 1 comes the instrumental "A New Career in a New Town," which plots the distance from Bowie's Anglocentric career to his new Teutonic mode, bridging the former's refractory squelched riff and the latter's dreamy gauze with a searching harmonica phrase: a regular substitute for emotion that the human voice can't reach, but a brilliantly strange idea in this context (as well as another Dylan affectation). Here, it's bittersweet, nostalgic but propelled by forward motion, and a resolution to commit to a place and escape his blue room funk. The mostly instrumental second side is a tribute to the people of the Soviet Bloc —Poland on "Warszawa," and East Berlin on the remaining three songs—in which the elusive nature of side 1 subsides and Bowie's persona is subsumed into his and Eno's pulsating sequences. These were carefully calibrated attempts at killing the author: Eno set out a metronome pulse, and the pair selected a random beat on which to introduce a new musical complement to the central motif. On "Warszawa" that’s an eerily simple piano tune that was inspired by overhearing Visconti’s infant son playing to himself; "Art Decade," mostly Eno’s invention, circles around a ghostly melody worthy of "The Twilight Zone." Bowie shrouds the tune to "Scarborough Fair" inside "Weeping Wall," and a lonely saxophone (played by Bowie himself) eventually joins the cathedral of male vocals and strings on "Subterraneans." It’s credit to their influence that these songs sound pedestrian, even a little ponderous by today’s standards, but the way they conjure lost worlds is still something to behold, like the depths of dank paintings being X-rayed before your eyes. The perpetual stranger finally finds comfort in a strange land, synthesizing his dislocation (and his love of the expressionist Brücke artists) and that of these broken nations with a tense, beautiful, elemental music that speaks of genuine engagement, and an empathy that seemed impossible on side 1. 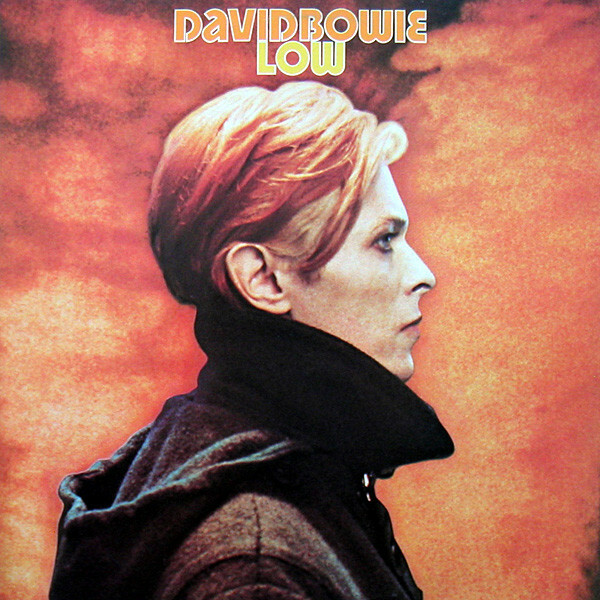 It makes good on the album cover's subtle joke: a still from Nicolas Roeg's The Man Who Fell to Earth where Bowie’s orange hair fades into the background; the word 'Low' atop a vanishing profile. Bowie's meticulously crafted existence had always offered fans a sense of possibility. By submitting his ego to Low, he was able to create a new one for himself.